The stage is set for today’s official weigh-in of boxers appearing in to­morrow’s South Pacific Boxing Pro­motion at Prince Charles Park, Nadi. 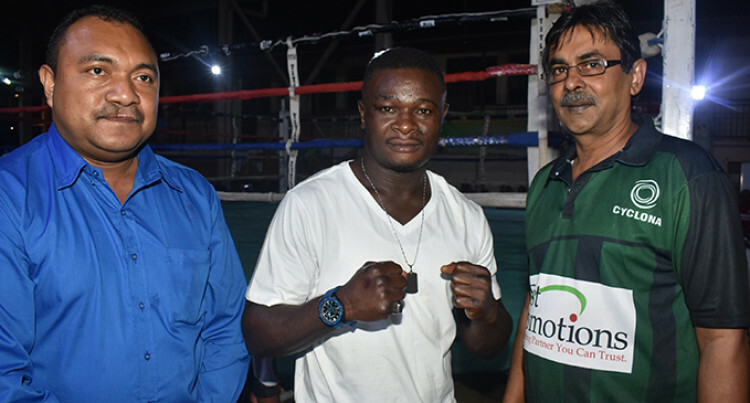 Promoter Freddy Chand on Wednesday night clarified that welterweight boxer Ron­ald Naidu has been medically cleared and is ready for his first national title fight against Rakuro Daunivavana. “Rakuro has made the weight while Ronald is a natural welterweight,” he said. For the light heavyweight title fight Joseph Kwadjo of Suva is going to test hard hitting Savenaca Naliva of Sorokoba, Ba. The weigh-in is at 2.30pm at the Nadi Civic Centre. The programme sees the return of Fiji heavyweight champion Petero Qica who takes on Sikeli Navuni in a four-round fight. Qica last fought in 2011 when he stopped former champion Mosese Kavika in the sixth round. In another thriller hard hitting Navosa’s middleweight boxer Abhay Chand takes on journeyman Nereo Cakautini in an eight-round bout.